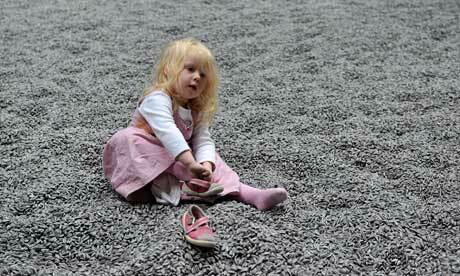 The floor is entirely covered with a deep layer of what appear to be grey pebbles. It is like a bleak Suffolk beach, and a toddler, getting into the spirit of it, has shed her shoes and is having a sit-down in her stockinged feet. Adults are not so comfortable: as if caught out by a freak snowstorm in the wrong shoes, several are picking a distinctly wobbly way over the crunchy, uneven surface, suddenly looking out of place in autumnal London clothes. 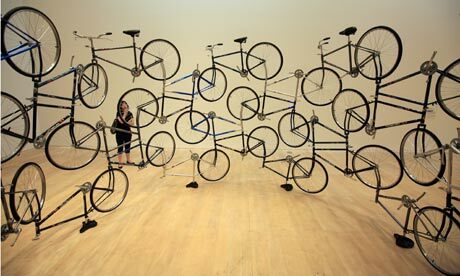 There is more to Chinese artist Ai Weiwei's installation than meets the eye, however. Bend and pick up one of the "pebbles" and you can see that it resembles a sunflower seed encased in its striped husk. In fact, each one – and there are 100 million of them, covering an area of 1,000 square metres – is handmade from porcelain and has been individually handpainted. Ai – a bearded, impassive, black-clad figure, who snapped the photographers surrounding him at today's press view almost as busily as they did him, and posted the results on Twitter – had the "seeds" made in the southern Chinese city of Jingdezhen. "Historically, the town's only activity has been making porcelainware for over 1,000 years. The super-high-quality skill for generations has been making imperial porcelainware," he said. "In modern days, however, it has become very commercialised." 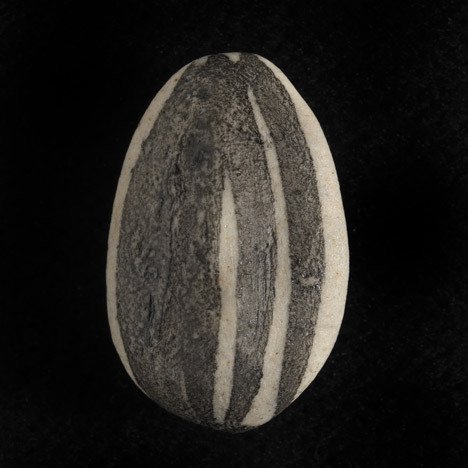 Harnessing traditional craft skills, each seed was moulded, fired, and painted with three or four individual brush strokes, often by women taking the objects home to work on them. One thousand six hundred people were involved in the process. "Even taxi drivers were talking about it," he said. "I tried to explain to [the artisans] what we wanted them for, but they found it very difficult to understand," said Ai. "Everything they usually make is practical, and the painters are used to creating classically beautiful flowers using a high degree of skill." He said that the workers had been paid a living wage – in fact slightly more than customary – to work on the project. "Now they are asking when we can start again," he said. "I shall have to think of a new project." Sunflower seeds, he said, had a particular significance in recent Chinese culture and history. During the cultural revolution, Mao Zedong was often likened to the sun and the people to sunflowers, gazing adoringly at his face. But sunflowers were also a humble but valued source of food in straitened times, a snack to be consumed with friends. What if the temptation to put one of these lovingly made objects in your pocket becomes too great? Smiling, he said: "They might also want to eat one, and that would be a safety issue for the museum." He added: "If I was in the audience I would definitely want to take a seed. But for the museum, it is a total work, and taking a seed would affect the work. Institutions have their own policies. But I know I would want to take a seed." A spokeswoman for the museum confirmed that they would be "encouraging people not to" depart with a souvenir. After the installation at Tate Modern is closed the seeds, which weigh 150 tons, will be shipped back to Ai's studio in Beijing, where he will think about using them for another project. Did he make any of the 100 million sunflower seeds himself? "I made three or four," he said. "But none of them was any good." 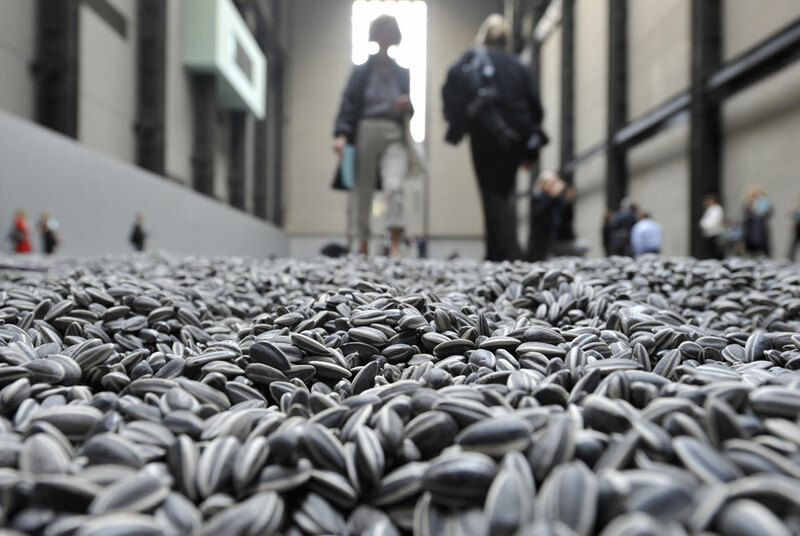 Courtesy of Chinese artist Ai Weiwei, the Turbine Hall is now carpeted with a million hand-painted seeds – an image of globalisation both politically powerful and hauntingly beautiful. 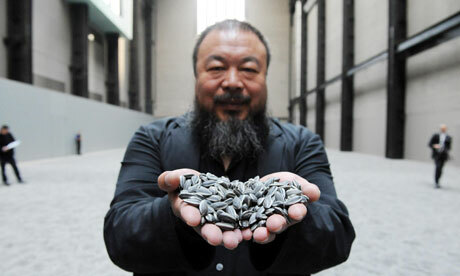 When you first meet him, Ai Weiwei seems as solid and impassive as a pillar of granite. He leads the way into his home without a word, then sits silently at the head of a long wooden table. But on the wall of his elegant, open-plan home, in the outskirts of Beijing, hangs a single image: of a hand with its middle finger raised. Ai has plenty to say. Indeed he has so much to say that the 53-year-old is not only China's most famous living artist, but also a constant irritant to its authorities. When Tate Modern announced recently that it had commissioned him to fill its Turbine Hall later this year, it was a welcome reminder of his work, which in recent times has become almost overshadowed by his social and political criticism. But the voice itself was forged in his earliest childhood. "I experienced humanity before I should. When I was very young," he says. If that sounds grandiloquent, consider his history: Ai spent years of his childhood in a labour camp in the far north-west of China, on the edge of the Gobi desert. His father, Ai Qing, was an artist and one of China's most revered modern poets, but fell foul of the late 1950s anti-rightist campaign. Life was precarious, and his parents had little time to spare for their offspring. "It was like being a little boy in the centre of a storm. Just always scared or surprised by surroundings that you cannot make sense of. And you have no comparisons because you have no memory of what another life can be," he says. But 12 years later, when his father fell ill, he moved back to Beijing. He did so with little to show for his time in the US, at least to the outside eye. "I hadn't become very rich or got status or become part of the American dream – I had no success. I hadn't got my school diploma [or] American citizenship – that's unique for the early Chinese students in the US; those are two things they all got. I was unmarried, didn't have a real job, couldn't drive. So my mother really thought I'd never been there. She was shy to even introduce me to her friends," he says jokingly. Ai's father sensed his discomfort on returning and offered some advice: don't be courteous. Treat this country as your home. Do whatever you want. The artist is still grateful for those words, though one feels the Chinese government may be less so. Ai helped to design the "Bird's Nest" national stadium for the 2008 Olympics – then blasted the country's "disgusting" political conditions and the use of the games as propaganda. Since then he has championed a number of sensitive causes, notably internet freedom and justice for children who died when shoddy schools collapsed in the devastating Sichuan earthquake. Others have fallen foul of the government for far less, and supporters fear Ai's position and his father's reputation will only shield him for so long. Certainly, the authorities seem to regard him, increasingly, as a problem. His China-based blog has been closed down, his email account hacked into, and security officials have made inquiries at his bank. In Chengdu last year, police detained him and fellow activists to prevent them attending the trial of a campaigner investigating schoolchildren's deaths. In the furore, a policeman punched him in the head, leaving him with painful headaches; weeks later, while working in Germany, he underwent surgery after doctors spotted internal bleeding. "Life is never guaranteed to be safe so we better use it when we are still in good condition," he says now. "I always think that incident shouldn't have happened that way. Other than that . . . I don't want the bad memories, bad incidents, to stop me or have an effect on me." "The state is taking action against people who have peacefully demonstrated their ideas. They are writers – all they did is to express their minds through the internet. So the pattern is very clear. The state tries to maintain stability by crushing any thought of making change," Ai says. "It could happen to me, because I did the same thing and in many cases I went much further and deeper. But I always think the government can learn from their mistakes – they should learn and should understand; they should be just as intelligent as anyone else. I have to be wishful [optimistic] in that sense." His father's experiences have left him, he says, with a sense of duty "to speak for the generation, or generations, who didn't have a chance to speak out". "And I also have to speak out for people around me who are afraid, who think it is not worth it or who have totally given up hope. So I want to set an example: you can do it and this is OK, to speak out," he says. And then, of course, there's his art. Ai's growing profile as a government critic has come swift on the heels of artistic acclaim for works such as his photographic series "Dropping a Han dynasty urn", which captures his destruction of an ancient vessel. But to Ai there is no meaningful distinction between his art and the rest of his life: "I'm not worried viewers will be distracted [by my activism] – I am worried they will not," he says. "I would never say I am just an artist or have some higher aesthetic values." In recent years even his work for galleries has become overtly political, blurring the boundary between art and activism – at a recent show in Munich, his Remembering installation comprised 9,000 children's backpacks, in reference to the death toll of pupils in the 2008 Sichuan earthquake. Attached to the outside of the Haus der Kunst, they spelled out a grieving mother's words: "She lived happily for seven years in this world." But he says his relationship with the country has been strengthened by his struggles with it. He makes a noise somewhere between a laugh and a sigh when asked if he fears the authorities might bar him from returning to China one day. "People have said, if you leave, you may never come back. Or they may not even let you leave. So this is always a cost you may have to pay," he says. "But I don't want to restrict myself: when it happens, it happens. I have to deal with it, but not to prepare for it, because it is a kind of stupidity. If you prepare for it too much, you become a part of it." 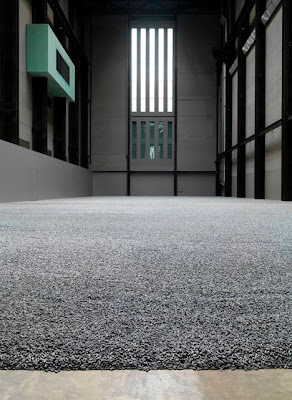 Following his recent October opening at the Tate Modern, on November 5, 2010, Ai WeiWei, Chinese artist and activist, was placed under house arrest by the Chinese police. Weiwei said this house arrest was planned to prevent him from attending a party to mark the demolition of his newly built Shanghai studio, an order from the Chinese government. We learned on Artdaily, that just as he was finishing construction on his new studio, he received a notice from the government informing him that he would have to knock it down. In good activist fashion, Weiwei planned a party to commemorate and draw attention to this event. As China opened up to foreign trade in the eighteenth century European botanists were compelled to record the plants they encountered for the first time. Rather than return home with dry and lifeless specimens, native artists were employed to produce drawings from living species, particularly around the ports of Macao and Canton. Though Chinese artists could boast a long tradition of flower painting, their abstract style was very different from the precise botanical illustration undertaken in Europe. In order to satisfy their patrons' tastes, these native artists began to study European examples and to adopt the same conventions. This study of a peanut plant shows the characteristically hybrid style that emerged. Attesting to its European influence, the drawing is arranged on a blank page and every detail, including the last nibbled leaf is recorded. Nevertheless, there are still Chinese traits such as the flattened perspective. 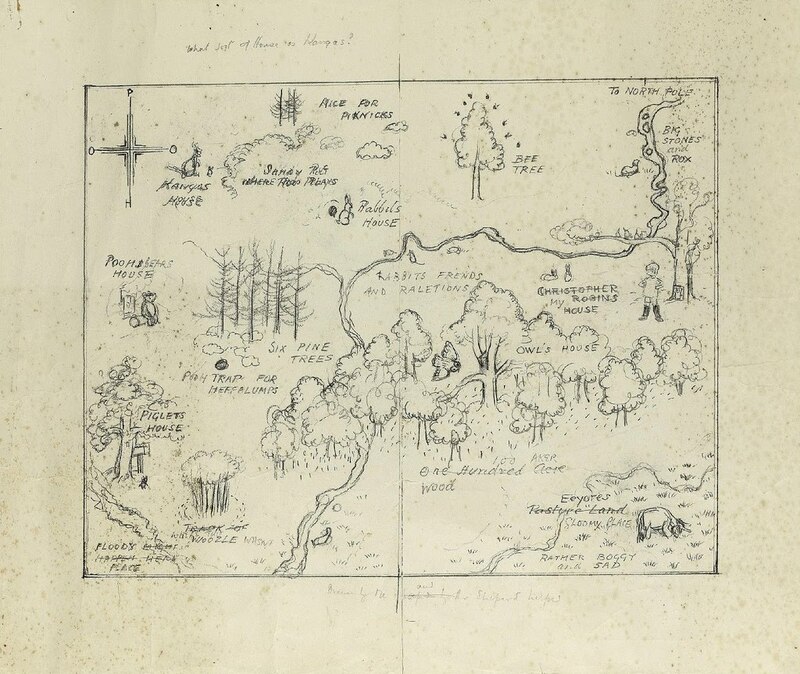 Preparatory sketch-map for endpapers of Winnie the Pooh. 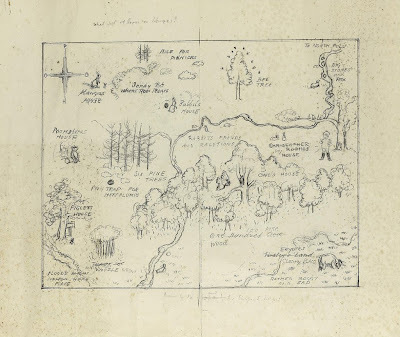 "This is a preparatory drawing for the sketch-map reproduced on the endpapers of Winnie-the-Pooh and therefore one of the most celebrated locations in children's literature. Although the geography was not revised, several captions were evidently changed. 'Eeyores Gloomy Place' was originally 'Eeyores Pasture Land' and the 'Floody Place' was originally captioned 'Floods Might Happen Here'. Shepard also poses the question 'What sort of House is Kangas?' 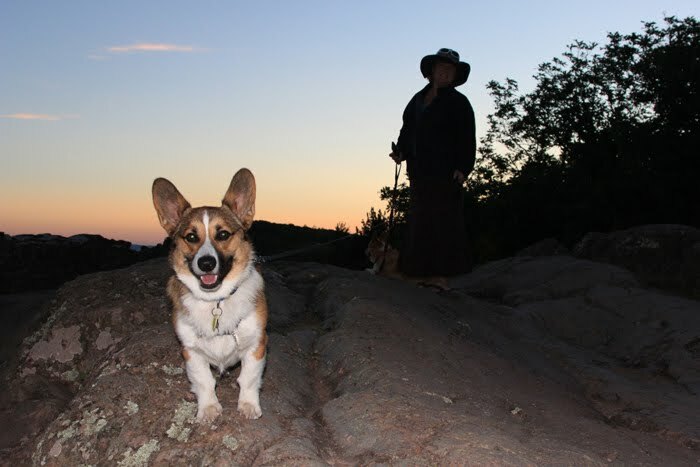 at the top of the map. The caption at the foot originally appeared as 'Drawn by Me helped by Mr Shepard' and shows a process of revision to 'Drawn by Me and Mr Shepard helped'. It was printed as 'Drawn by Me and Mr Shepard helpd'." PASADENA, CA. 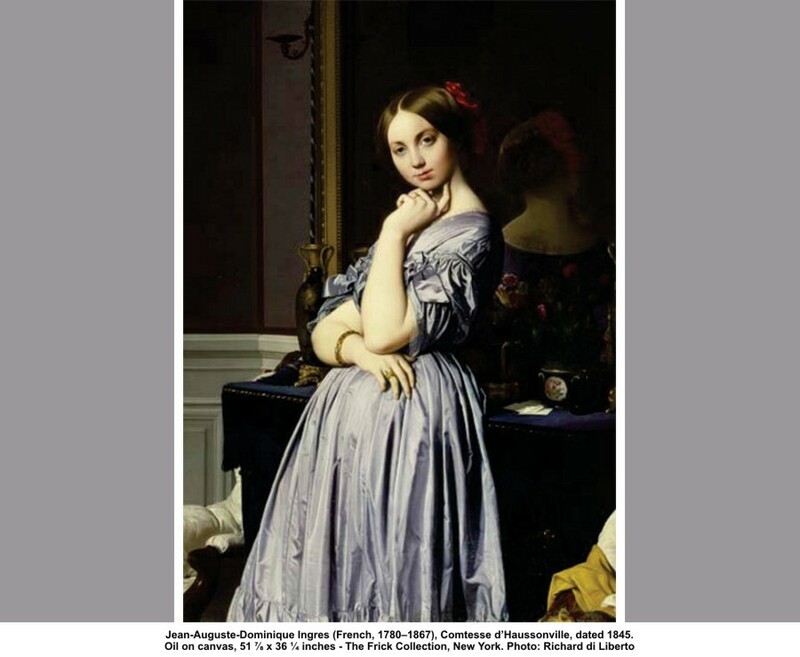 - The Norton Simon Museum will present a special installation of Jean-Auguste-Dominique Ingres’s stunning portrait of Comtesse d’Haussonville, 1845, on loan from The Frick Collection in New York. This portrait of the comtesse, a young woman known as Louise, Princess de Broglie, is the first loan from the Frick in an art exchange program between the venerable New York institution and the Norton Simon foundations. This captivating, large-scale work has never before traveled to California. Two related preparatory drawings from the Frick’s collections will accompany the work. Comtesse d’Haussonville will be on view at the Norton Simon Museum from October 30, 2009, through January 25, 2010. Two preparatory drawings by Ingres will accompany the painting—one a direct study, executed around 1843 or 1844, which shows this same pose and his process in dealing with the folds of her elegant dress; the other a preparatory detail drawing for an 1839 commission for his monumental work, The Golden Age. All three works will hang alongside the Norton Simon’s portrait of Baron Joseph-Pierre Vialetés de Mortarieu, also by Ingres. 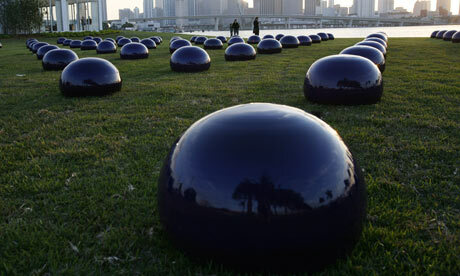 A series of lectures and educational and family programs will be organized around the installation. 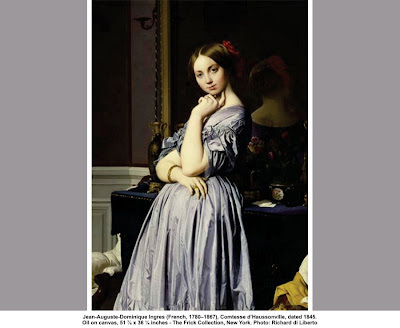 A related exhibition, “Gaze: Portraiture after Ingres,” runs from October 30 through April 5, 2010. Jean-Auguste-Dominique Ingres (French, 1780–1867) left behind a rich and varied body of work created during his long life. While many of his most known paintings are historical and religious depictions, his series of portraits, many of them of well-born, beautiful women, are among his most captivating. Ingres began his portrait of Louise d’Haussonville (1818–1882) in 1842, when he was 62 and the comtesse was 24. The picture shows the lovely young woman standing before a hearth in a well appointed room, a mirror on the wall reflecting the back of her head and neck. She wears an elegant, Delft-blue silk dress, its folds and details resplendent, a few pieces of gold jewelry, and an ornate red ribbon and tortoiseshell comb in her hair. One arm rests across her waist, the other is bent upward, and her hand is tucked under her chin. The comtesse looks directly ahead, and her slight smile and open expression invite the viewer into this lovely scene. When we lived in Bethel this is how the Lincoln sculpture looked in the downtown I always loved looking at it. Then when we moved to the mid-west and stumbled upon it again in Illinois I now think of it as something I was supposed to see and remember. 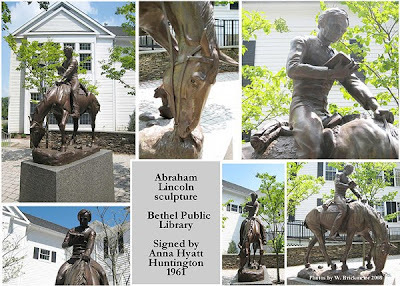 Anna Vaughn Hyatt Huntington (March 10, 1876 – October 4 ,1973) was a prolific and innovative American sculptor. She was a master of naturalistic animal sculpture. Particularly noted for her equestrian statues she was active over a period of 70 years. Huntington is recognized as one of America's finest animaliers, whose naturalistic works helped to bridge the gap between the traditional styles of the 1800s and the abstract styles of the mid-twentieth century. Her prominence also enabled other female artists to succeed. Her innovations in technique and display, as exhibited through her aluminum statues in Brookgreen Gardens, guarantee her place in the annals of art history. During the 1940s and 1950s, she was increasingly distressed by modern art and what she considered a tasteless machine age. However, despite widespread public interest in abstract sculpture, Mrs. Huntington continued to win recognition and awards. She did her last equestrian statue when she was 91. Huntington, along with her husband, Archer Milton Huntington, helped found nearly 20 museums and wildlife preserves as well as America's first sculpture garden, Brookgreen Gardens in South Carolina. 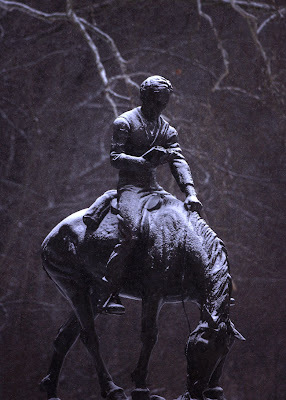 In anticipation of the bicentennial of Abraham Lincoln's birth in 2009, the 2006 Springfield City Ornament depicts Abraham Lincoln:On the Prairie, the sculpture at the entrance to New Salem where he lived as a young man. 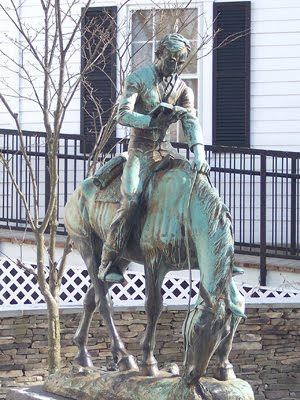 The sculpture by Anna Hyatt Huntington portrays young Abe on horseback, reading a law book. Springfield artist Stan Squires interpreted the statue for the ornament design, silhouetting Lincoln and his horse between wisps of prairie grass and a split-rail fence.